In this presentation you’ll see how we developed (what we used) the live video platform for the FIFA World Cup 2014. It shows how we made it scalable using lots of open source solutions. http/2 over tls with nginx is already a reality, how can we achieve the best performance of it? check the example configuration. We all know that http/2 is right here and although it doesn’t impose the TLS usage, the major browsers already took their side (a.k.a only supporting http/2 over TLS). The support for http/2 was released with nginx 1.9.5 (except for “Server Push”). But isn’t HTTPS a lot slower than good old HTTP? Well, this is not easy to answer but we can fine tune nginx to do much better than the default configuration. I really believe that the biggest fight is against latency not CPU load, the tips you’ll see here are mostly about reducing RTT in order to decrease latency. When you leave the site and come back later, the browser will need to renegotiate the session. TLS session resumption is the technique to partially skip this negotiation by persisting the session for later usage. The left graph represents an over simplified version of a full TLS handshake (skipping TCP handshake) and on the right side you can see how TLS resumption works, the point is to skip RTT. If we skip part of the session negotiation we’ll delivery fast content. We do have two ways of solving this issue: saving the session (TLS) on server (session cache) or preferable on client (session ticket). In this case when client tries to reconnect, the server will try to recovery past persisted session skipping partially the negotiation. With this shared session (of 10m), nginx will be able to handle 10 x 4000 sessions and the sessions will be valid for 1 hour. For the second problem, the great project openresty is about to release a new feature (ssl_session_store_by_lua) which will enable us to save these sessions in a “central” repository (like redis). In this case, the server will create a ticket and send it to the client, when the client tries to connect again it’ll use the ticket and the server will just resume the session. Nginx comes with session tickets enabled by default but if you will deploy your application in more than one box (bare metal, cloud, virtual machines, containers …) you’ll also need to specify the same key (used to create the tickets), you should rotate this key often. Although this approach is much better than session cache, not all browsers support this so you might need to offer both solutions. How about to have the same benefit (skipping RTT) as in TLS resumption but when the browser first negotiate with the server?! This is possible by using and enforcing the forward secrecy. Instead of waiting the last handshake step from server, the browser will already send the data (request) and the server will reply with the data (response). This technique is known as TLS false start. Less RTT means faster site/video/image/data to final users. This is possible because we can extend the tls protocol by instrument it with specific ciphers. Creating trust is a hard task to do and part of the responsibilities of TLS is to enforce it. In order to establish this trust the browser (or you OS) needs to at least have one point to trust. 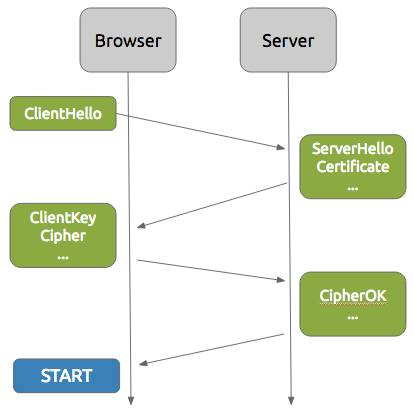 Both steps might force your browser to do more RTT, if your server doesn’t provide the intermediate certificates the browser will need to download them and it might even request an OSCP (requiring more RTT: DNS, TCP_HANDSHAKE, TLS_HANDSHAKE). Less RTT means faster site/video/image/data to final users 2. You can concatenate your certificate with its chain (except ROOT, it’s not necessary, in fact the browser won’t trust your ROOT) then avoiding extra RTT to download the missing certificates. You can set up nginx to avoid OCSP by stapling (this “staple” is digitally signed which makes possible for your browser to check its authenticity) the OCSP response on your server then you will avoid extra RTT for OCSP. Although the maximum size of a TCP packet is 64K, a new TCP connection starts with much less than this maximum. And each TLS record can hold at maximum 16K (which is the default size for nginx), summing up this size plus the headers of tcp and ip the server might need to make 2 RTT to serve the first bytes. And that’s not cool. TCP is great but it has limitations, it is not ideal for all kinds of applications and there is even “quic” efforts to make web faster with experimentations using UDP instead of TCP. Since we’ve reached our current speed limits, light speed, (who knows what “quantum” can do) we’re moving to avoid extra RTT. *you can’t use QUIC on nginx yet. Less RTT means faster site/video/image/data to final users. 🙂 Again!!! There is a tradeoff here, you can either chose throughput (TLS record size to max) or latency (a small record size). It would be great if nginx could offer an adaptive option, starting small (4K, to speed up the first bytes) and after 1 minute or 1MB it increases for 16K. HSTS “converts” your site to a strict HTTPS-only, it eliminates unnecessary HTTP-to-HTTPS redirects by shifting this responsibility to the client, most of the browsers support it. Even if you forgot to change http for https the browser will do that for you. Redirects means more RTT, yeah I know it’s getting repetitive but it’s to reduce latency. A simple http header to instruct the browser. #'max-age' values specifies how long browser should follow this rule. Why Chrome doesn’t show/accept http2? Users of the Google Chrome web browser are seeing some sites that they previously accessed over HTTP/2 falling back to HTTP/1. You can check what, why and how at nginx site. Upgrade to the latest: kernel, openssl and nginx. With this configuration I was able to get an A+ at SSLlabs, this is a useful tool where you can check what you need to do to make your SSL site better, it gives you specific tips (apache, nginx, IIS). And for sure HN and SO. You can learn a brief history about scaling linkedin and how they handled the problem of multi PoPs in the world. If you’re lazy about reading, watch this short video how browsers work. It’s crucial to understand how Browsers work so you can optimize your page to load fast, believe me speed is a feature. Let’s suppose your browser is getting a response from example.com. It’ll receive a stream of bytes then it will convert it to characters (following the adopted encoding) and parse the chars to tokens and finally build the nodes which constitute the DOM. A picture is worth a thousand words. A similar process will also happen to build the CSSOM. But we’re not done yet, usually a page requires dozens of external resources (mostly: images, js and css), some of these resources are block rendering. For example, a simple page has CSS and JS as external resources. The browser will first get HTML build the DOM then it’ll find that it needs to download the css and js, after these files are downloaded it needs to build CSSOM, run the JS and rebuild the DOM, only after all these steps the browser will render the page. But the same page using non blocking css (media type/query) and js (async attribute) will make it render quicker, the steps between the first download (html) to render are reduced. It’ll render the page after the first DOM building. All the great images above were stolen from Google’s web fundamentals. HTML and CSS are render blocking. For CSS you can specify media types and media queries to avoid render blocking. Will we only create and use dynamic languages in the future? Since I’ve playing with some dynamic languages (Ruby and Clojure), I have been thinking about why would anybody create a new static typed language?! And I didn’t get the answer. I started programming in Visual Basic and I taste its roots, which are almost all full of procedure commands (bunch of do, goto and end), then I moved to C#, sharper it changes the end’s for }’s and give us a little more power based on some premises: we can treat two different things in the same way, polymorphism. The last static language, but not the least, I used (and I use it) Java, abusing of his new way of treating a set of things equality, the interfaces and using its “powers” on reflections. Although when I started to use Ruby I saw that I could treat a group of things equality without doing any extra work. I still need to code models and composed types, even though we can create or change them dynamically using “real power” of metaprogramming. When I start to study and apply the Clojure and its principles, my first reaction was the rejection, how can I go on without my formal objects, how can I design software without a model in the head and so on. I wasn’t thinking about how actually I do software, currently I use TDD to design software and I don’t think what models I need to have, I do think in terms of “what I want”. At minimum, Clojure make me think about, do we really need object to design software?! . A three days ago I saw an amazing video about similar thoughts: Some thoughts on Ruby after 18 months of Clojure. Summarising: With my limited knowledge of theses languages, let’s suppose we use a function (which we don’t have source code) and we want to do something before that function is executed (intercept) using: VB I’ll need to check every single piece of code which we call this function and call another one, in Java we can use a AOP framework, in Ruby we can use the spells of metaprogramming. It seems that some frameworks, patterns and extra work aren’t needed more because of this dynamic language evolution. My conclusions using dynamic languages (Clojure/Ruby) for now it’s: I write less code and reuse them more easy, so I don’t see any reason to create/use a new static typed language, would you see any motivation to do that? PS: When I use C# (.Net Framework 1.3 – 2.0) it was not so super cool as today.